Venezuelan-style arepas, stuffed corn patties, are the focus of the home-style menu at this Avondale Estates eatery. : Venezuela native Lisbet Hernández made a name for herself purveying the dishes she grew up enjoying from her mother's kitchen. 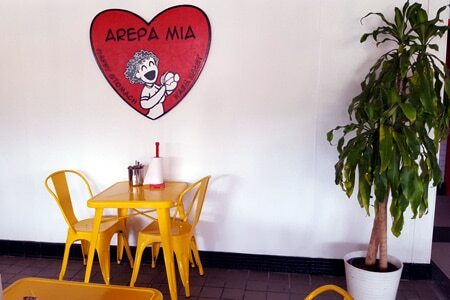 Moving her second outpost of Arepa Mia from Decatur to Avondale Estates, Hernández has developed a devoted following who fill her brightly decorated now-larger space, which is dotted with red and blue tables. Start with a cup of caraotas negras, or black beans, traced with a heart-shape of cilantro sauce and a bit of cream. Besides the popular arepas, corn patties stuffed with a variety of proteins or vegetables, there are cachapas that are like a corn pancake, soft and sweet, topped with meats, veggies and/or cheeses. Our favorite is the "pernil," or roast pork. Empanadas are made from a corn-based dough. Two larger dishes featuring grass-fed beef are available, but most offerings are small plates and they are filling. Vegetarians will find plenty to like. The place is gluten-free, and a dish can be made vegan if desired. Suppliers are Georgia organic producers, such as grass-fed beef from White Oak Pastures near Albany and pork from Riverview Farms. Check the Sunday specials at lunch, as they vary from week to week. No desserts, and no alcohol. Also located downtown at Sweet Auburn Curb Market, 209 Edgewood Ave. SE, 404-880-8575.